Well, it appears as though I’ve gotten the hang of this. I have no idea what it’s supposed to be, other than an example of my progress along the tambour learning curve. I am very pleased with how it looks. It has taken me a little longer than I’d hoped, but that’s probably because I’ve been watching TV while working on it. I really need to get my own tambour needle. 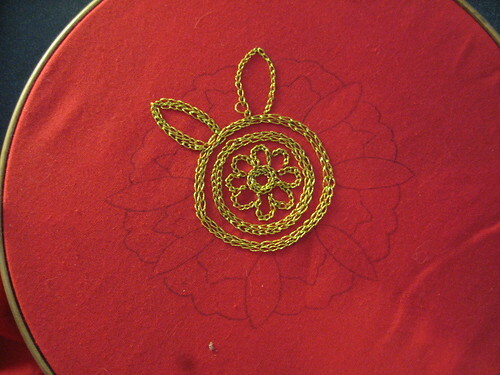 This entry was posted in sca and tagged chain-stitch, crafts, embroidery, gold, india, sca, tambour. Bookmark the permalink. 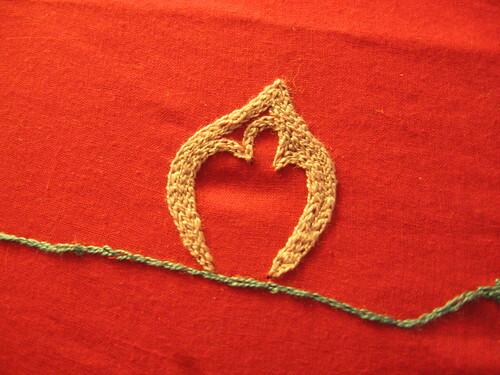 3 Responses to Chain stitch skills – I has them. Great post. 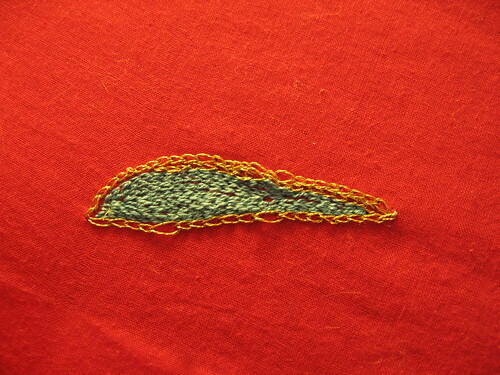 Modern Tambour Hooks are so tiny they make working with embroidery threads pretty difficult. Make sure you buy the largest hook size. I’m currently using an antique steal tambour hook – size 10. The video on YouTube by Prof. Rob Haven is very helpful. Mail me if you want more info. I hope to blog about this soon. Oh wow! You rock. 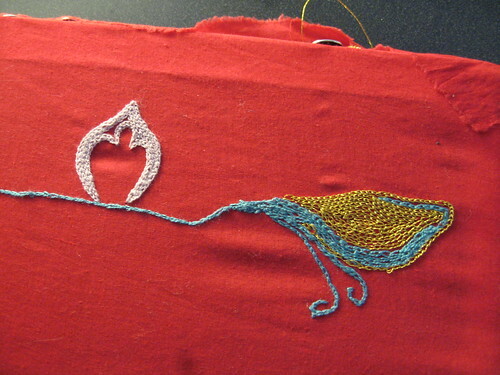 I am so jealous, since I really want to do some hugely embroidered big projects – queen-sized bedcover is first up. Well, then – it’s good that it’s easy to learn, and with your fiber/handwork knowledge, I have every confidence that you’ll pick it up just as quickly.